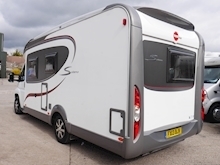 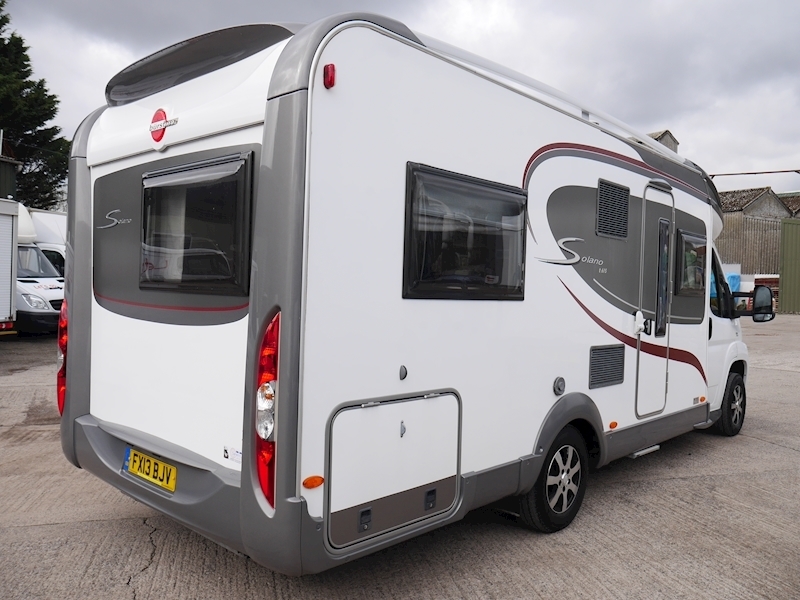 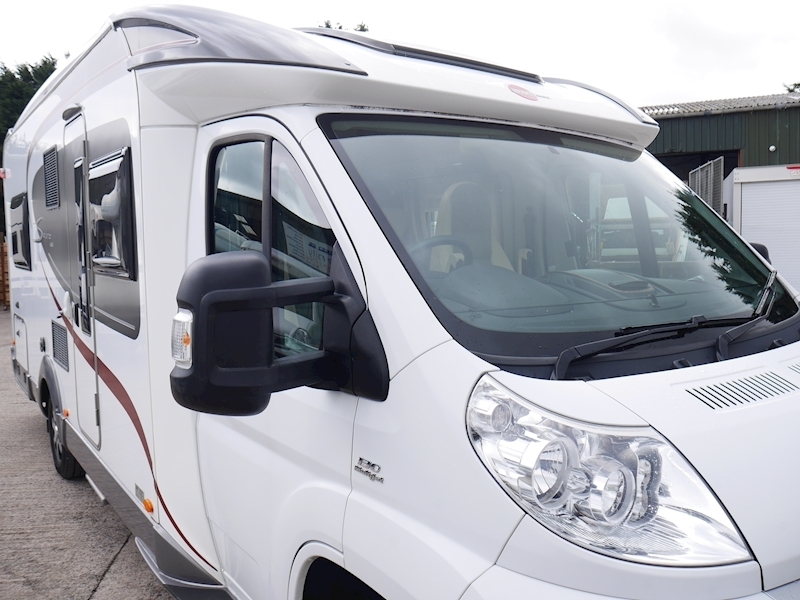 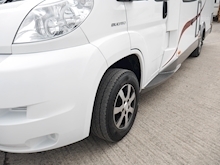 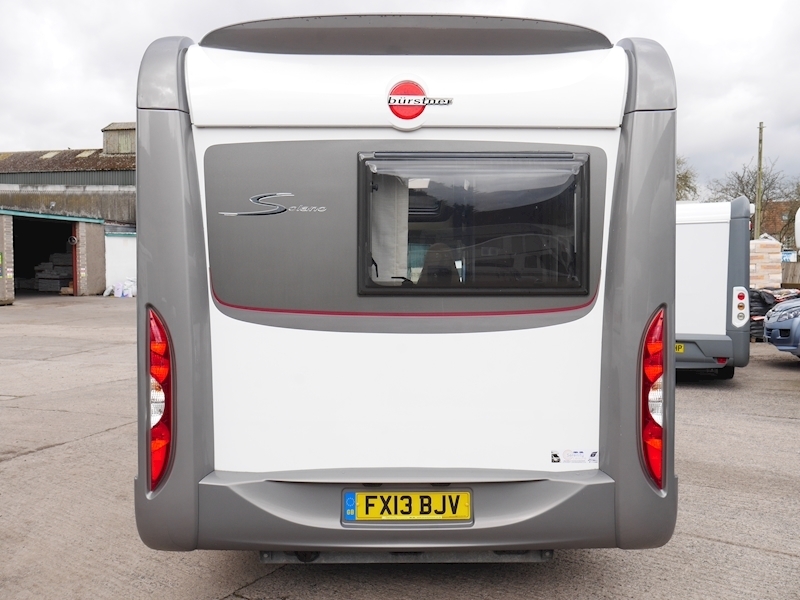 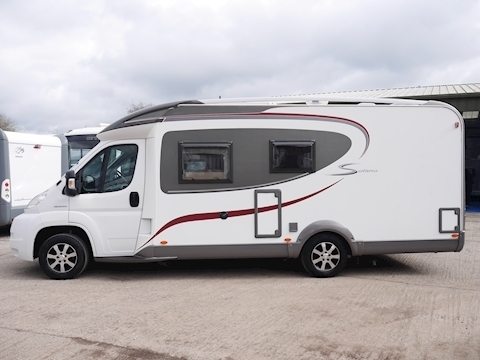 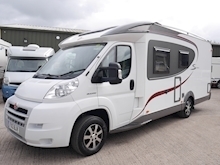 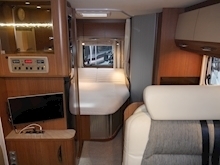 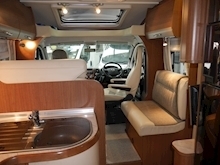 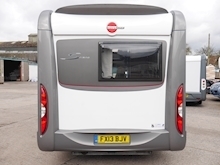 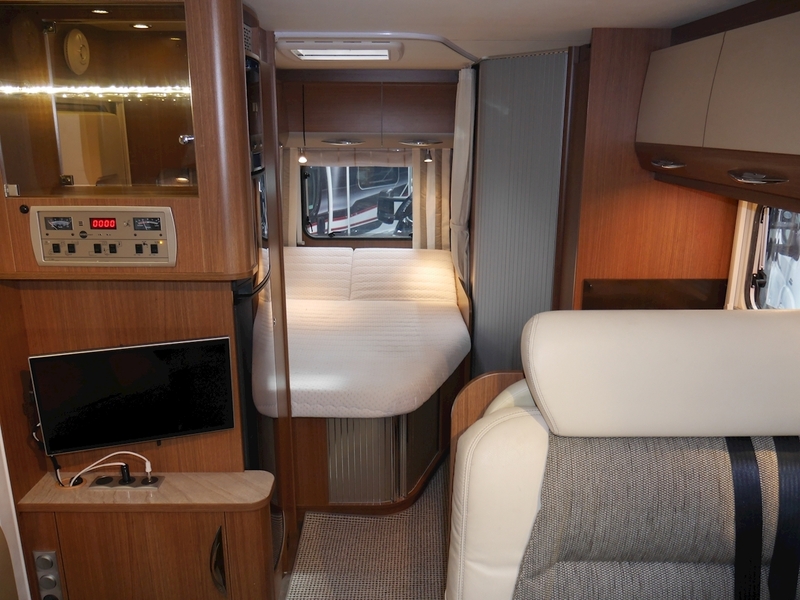 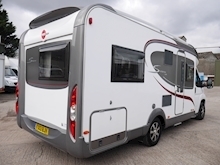 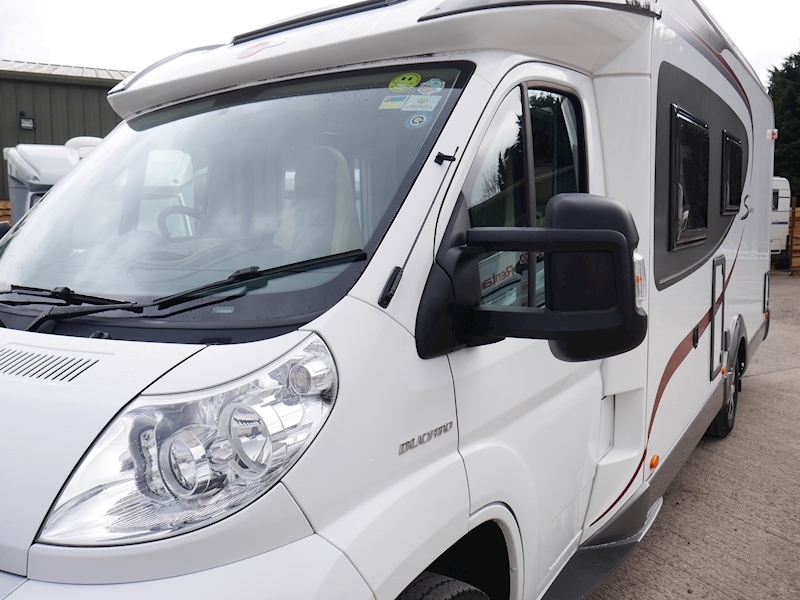 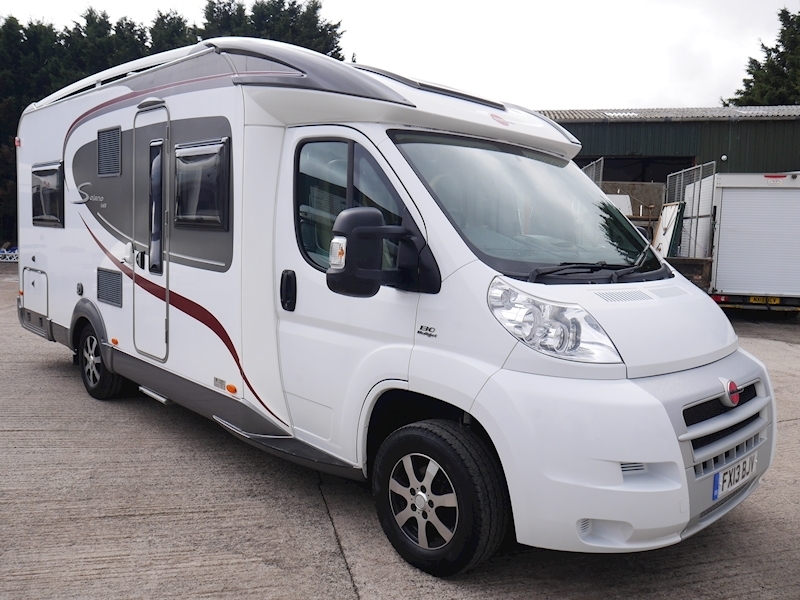 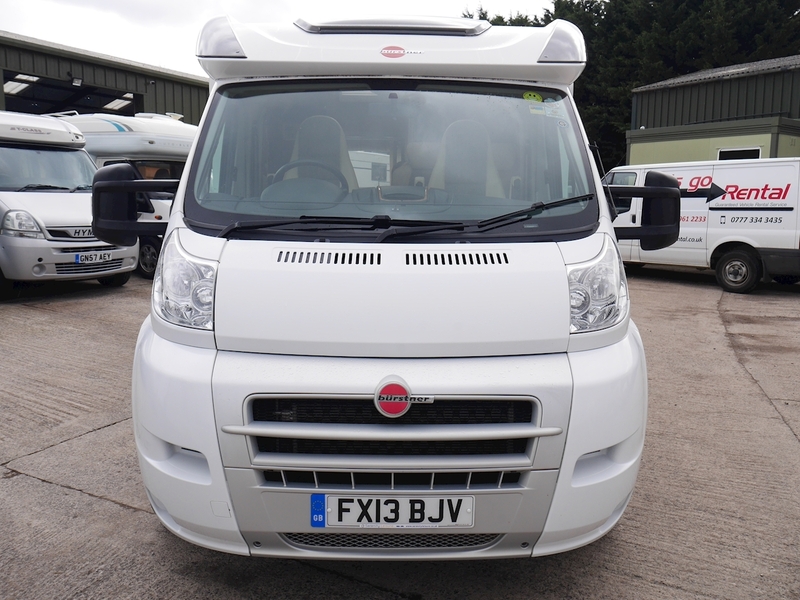 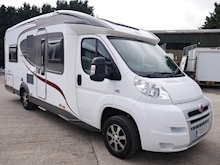 This 2013 Burstner Solano T615 is a premium four berth motorhome, housing a front lounge and a fixed bed towards the rear. The T615 has proven to be an exceptional seller, due to it's high quality and the fact that it is within the 3500Kg weight limit. Externally, you have a neat graphics scheme, combining excellently with alloy wheels and colour coded bumpers to create a striking appearance. 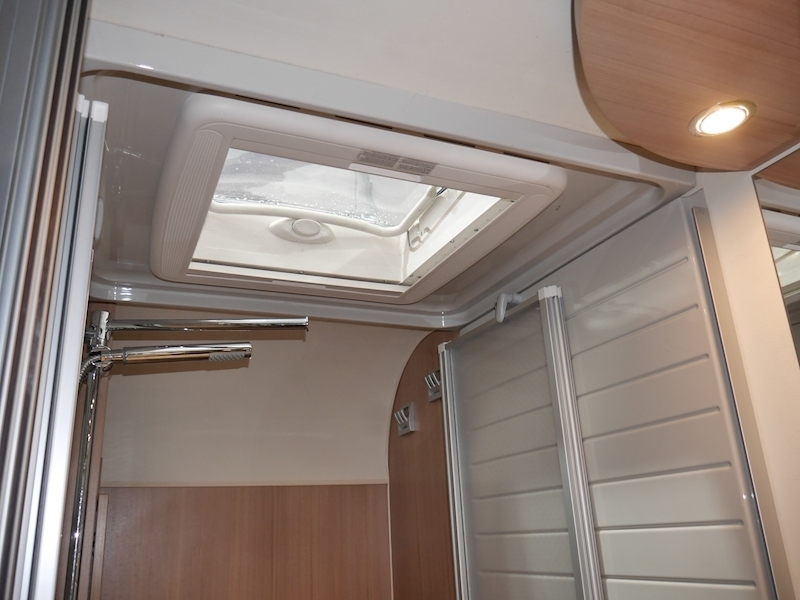 Taking a look on the offside you will find a fully reinforced habitation door, equipped with an electric entrance step and a Fiamma door lock for additional security. 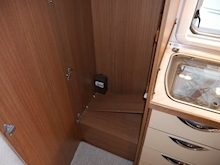 Towards the rear you have a generous sized locker, allowing access to beneath the double bed. 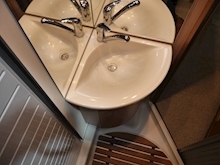 The gas cylinder locker, Thetford toilet locker, water inlet point and electric hook-up point can all be found on the nearside, whilst exterior specification is completed with a roof-mounted solar panel. 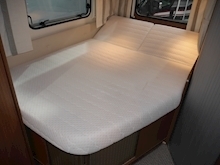 Internally the Solano is a very good example of Burstner quality. 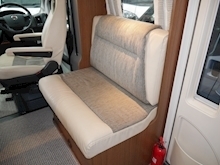 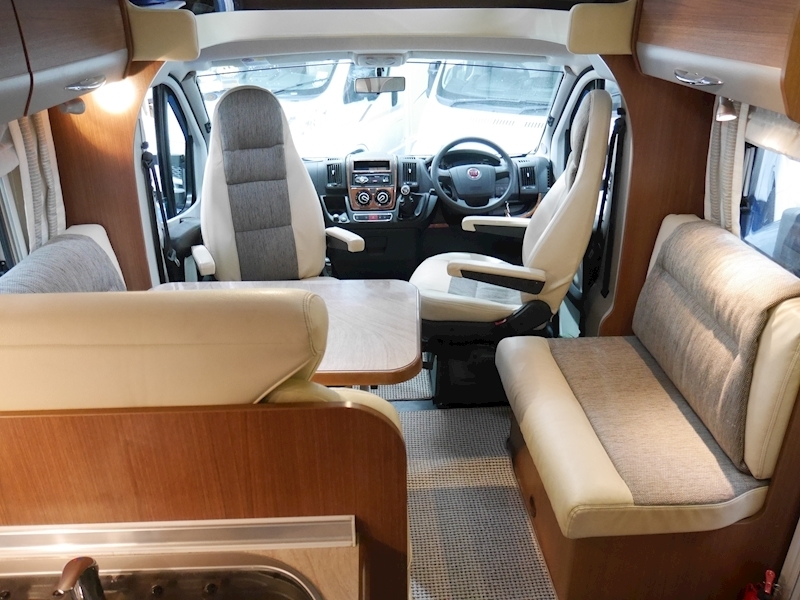 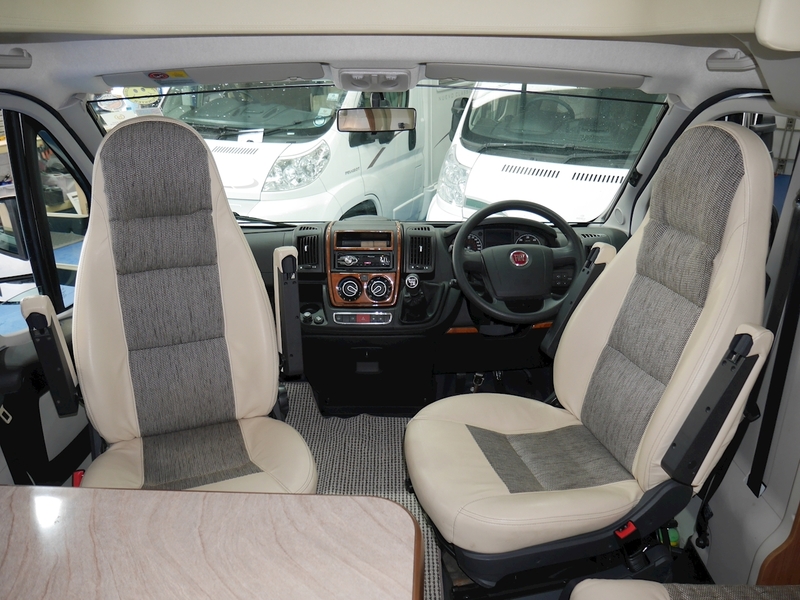 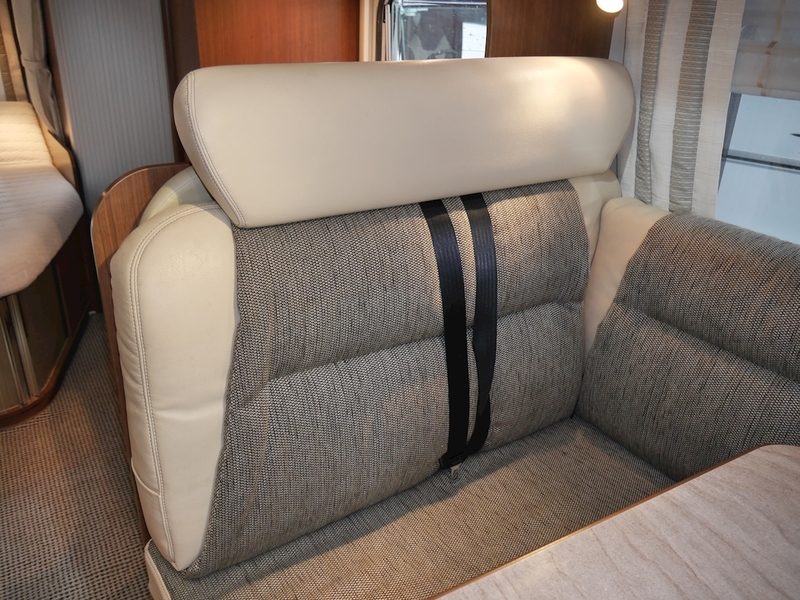 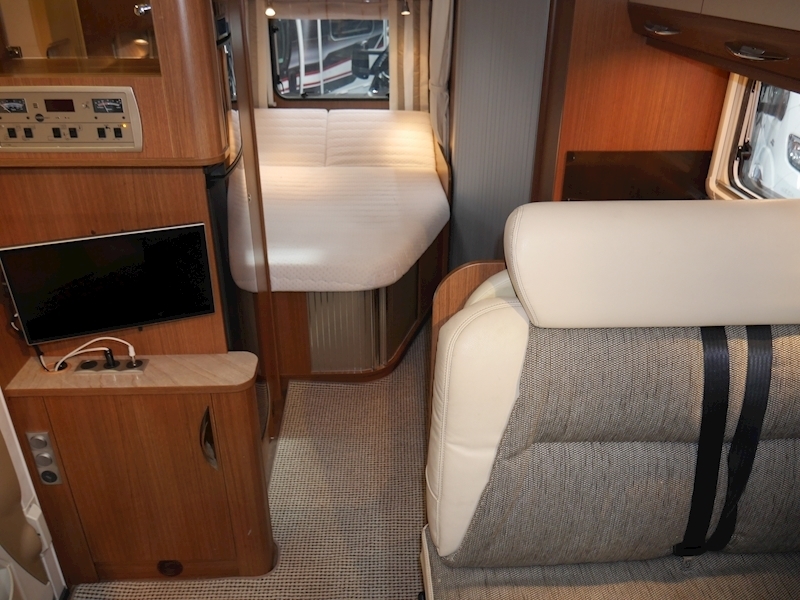 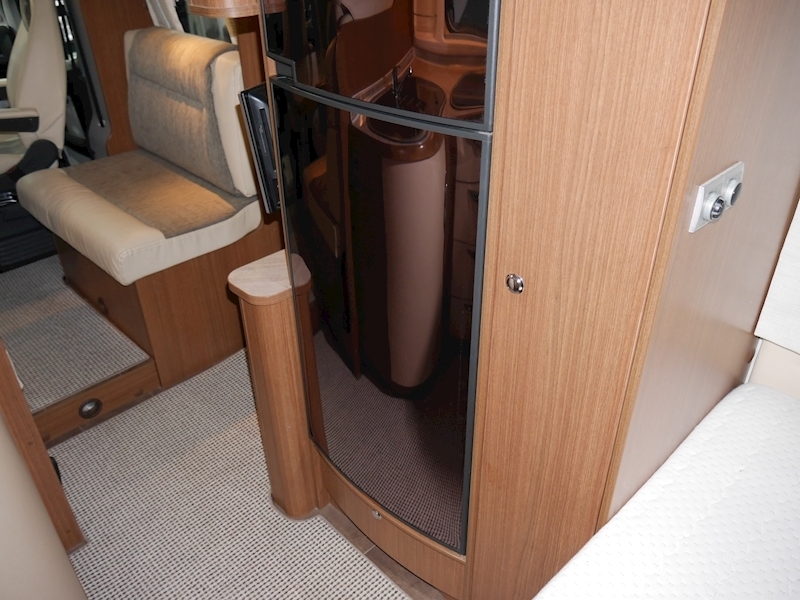 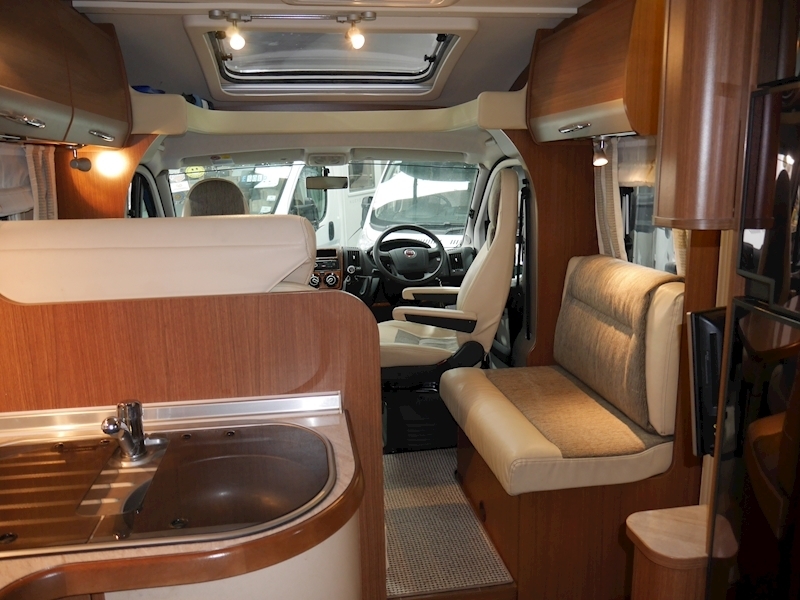 The wood finish is second to none and the luxurious half leather upholstery scheme provides a very nice touch. 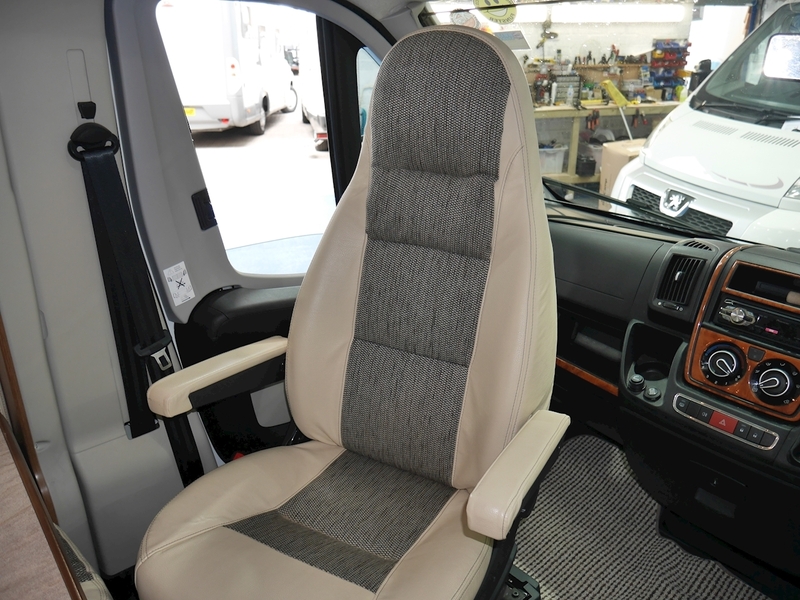 Focusing on the front cab area you will find twin seats, both of which have the ability to rotate and add to the lounge facility just behind. 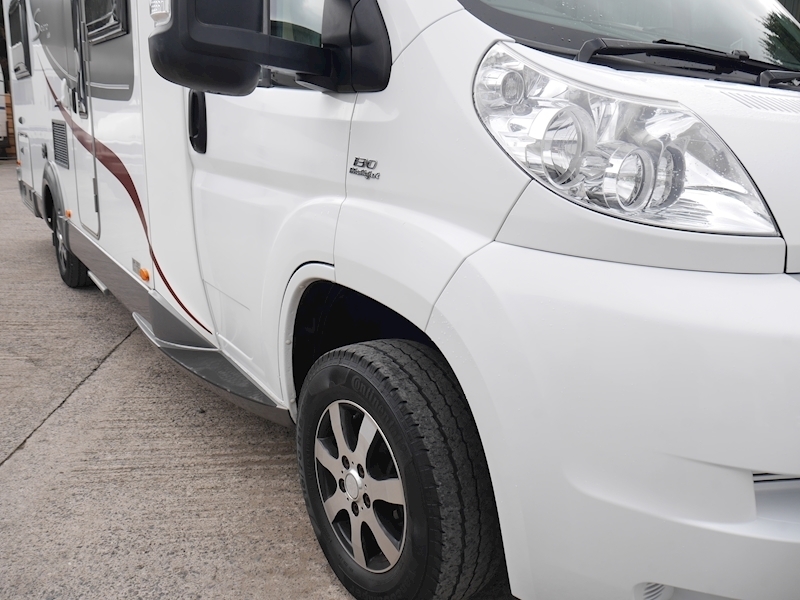 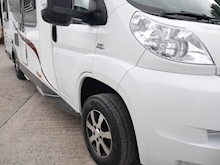 Equipment levels are very good too, you have: ABS, power steering, cruise control, electric windows and mirrors, air conditioning, 2 x 12v sockets, a radio player and Remis cab blinds to enclose the area at night. 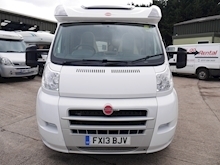 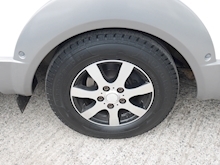 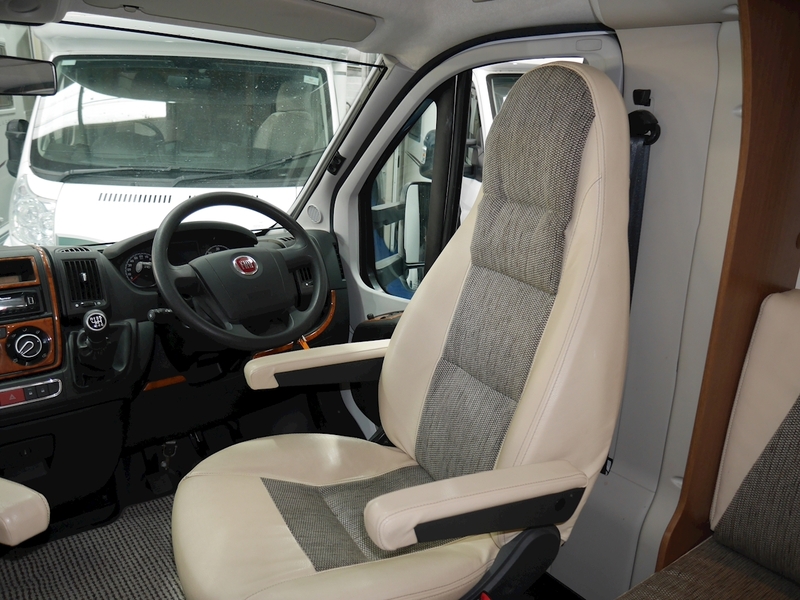 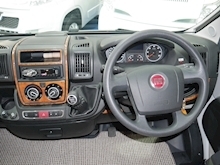 The base vehicle of the T615 is the Fiat Ducato 2.3jtd 130, six speed, which has covered just 22,500 miles from new. The lounge area is just behind and consists of an L-shaped settee along with a side sofa. The front facing section of the L-shape is equipped with two three-point seat-belts, taking the total travelling capacity to four. 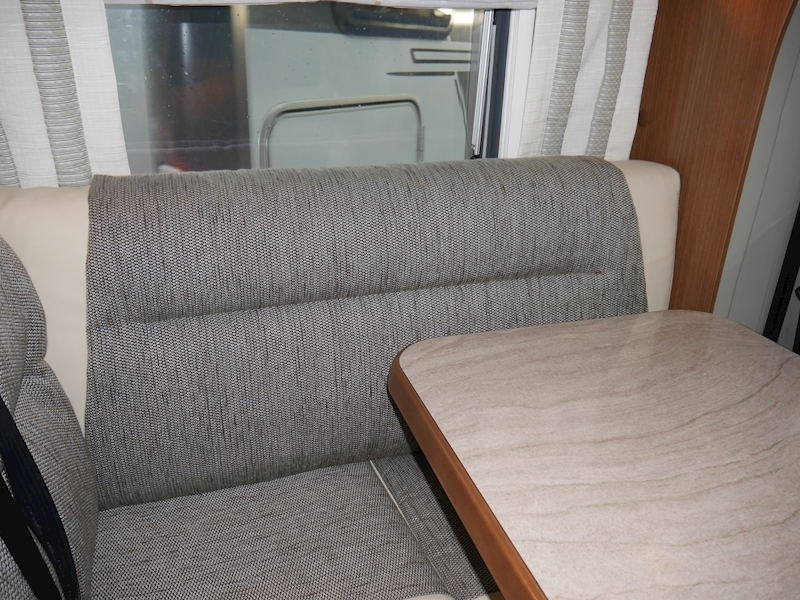 With the addition of the front seats roating, you are presented with a sociable setup. 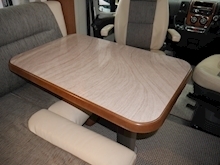 For dining there is a large table, which can be manoeuvred to your convenience. 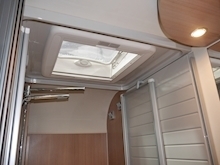 Storage facilities are provided within overhead lockers and space beneath the seating, whilst you have plenty of light sources, both natural and artificial. 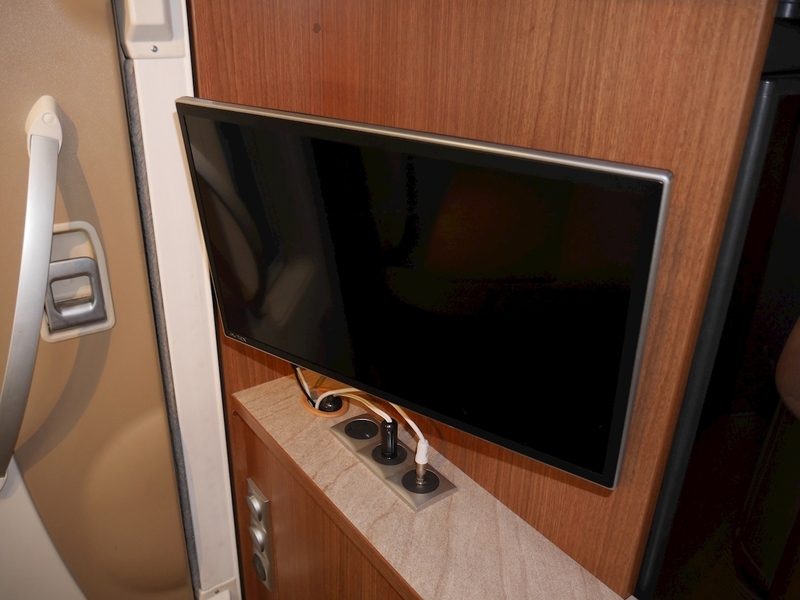 An Avtex television is found on the left as you enter through the habitation door and provides entertainment to the area. 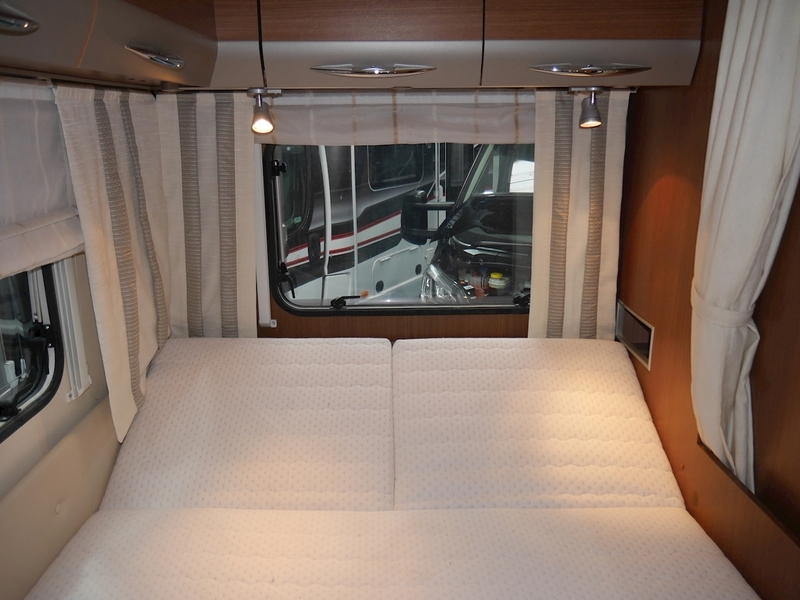 A further sleeping arrangement can also be configured here. The central kitchen is very well equipped and conveniently laid out. 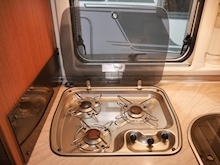 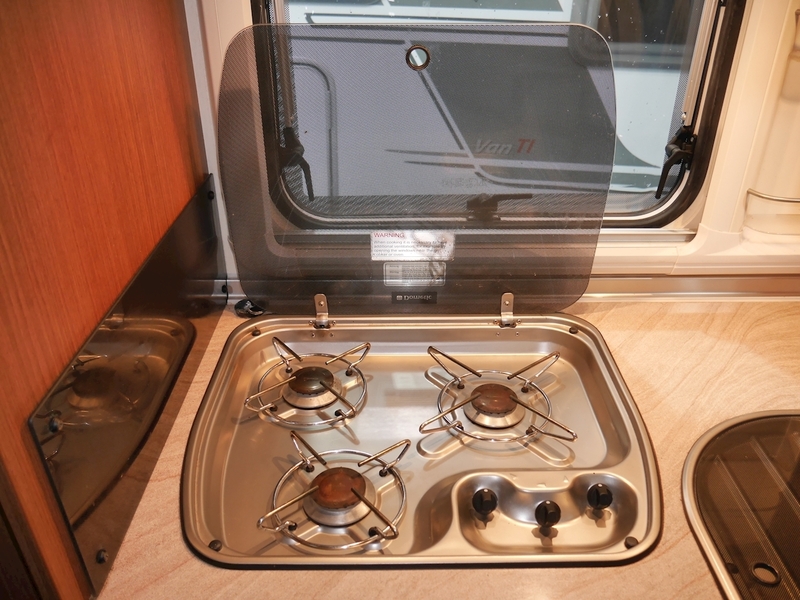 On the offside you have a Three burner hob and a stainless steel sink, both of which have glass covers for protection. 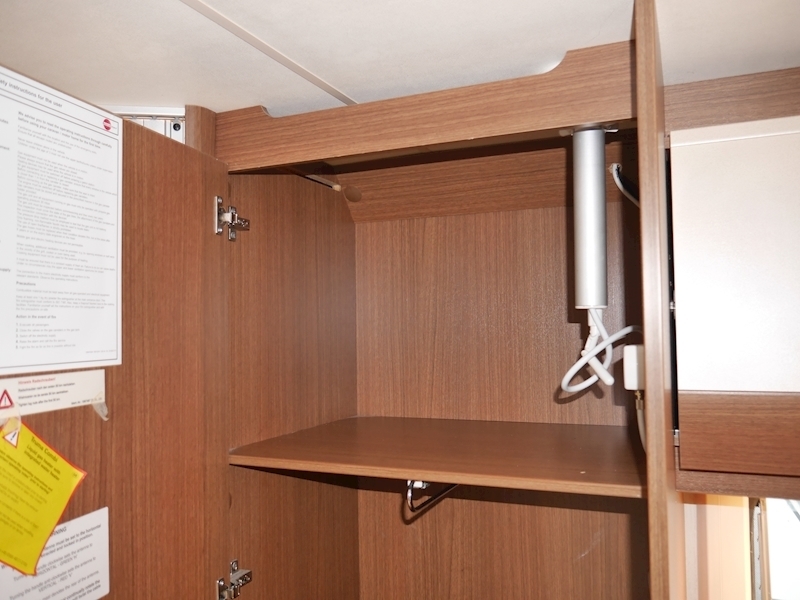 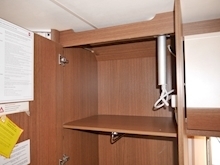 Storage can also be found on the offside, within overhead lockers and drawers. 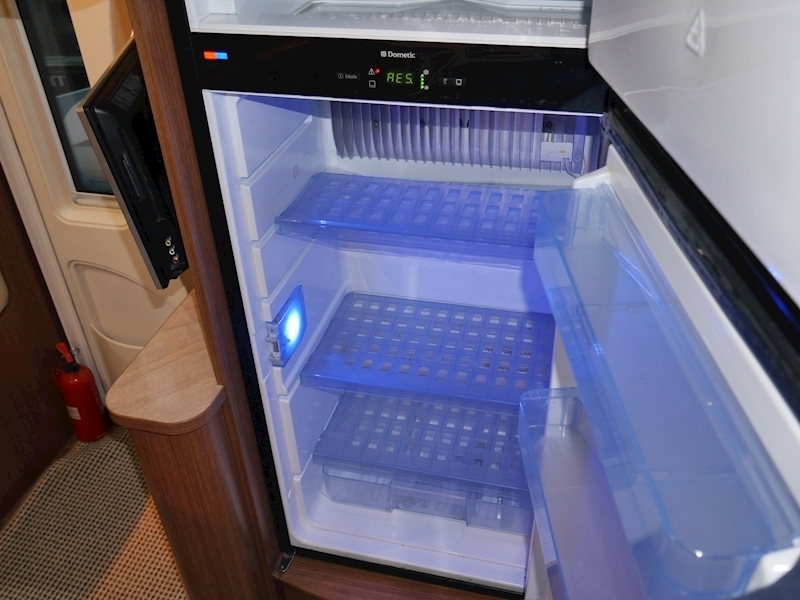 Directly opposite you have a full sized Dometic dual fuel fridge freezer, with an oven/grill combi unit integrated above. 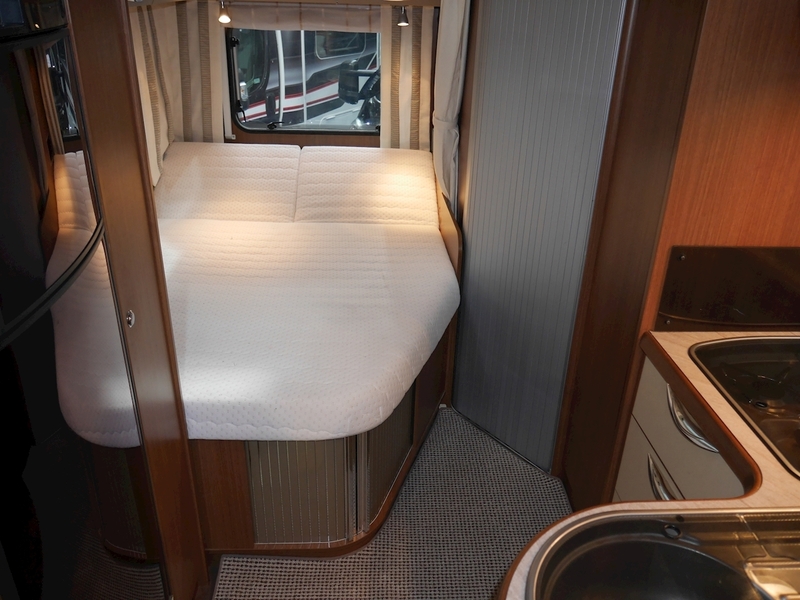 The bedroom area is just behind the kitchen and consists of a hugely comfortable double mattress, assuring a great night's sleep. You have the ability to raise/lower the top of the bed for your preference, whilst two windows surround the area and provide plenty of natural light. 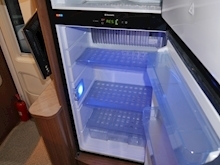 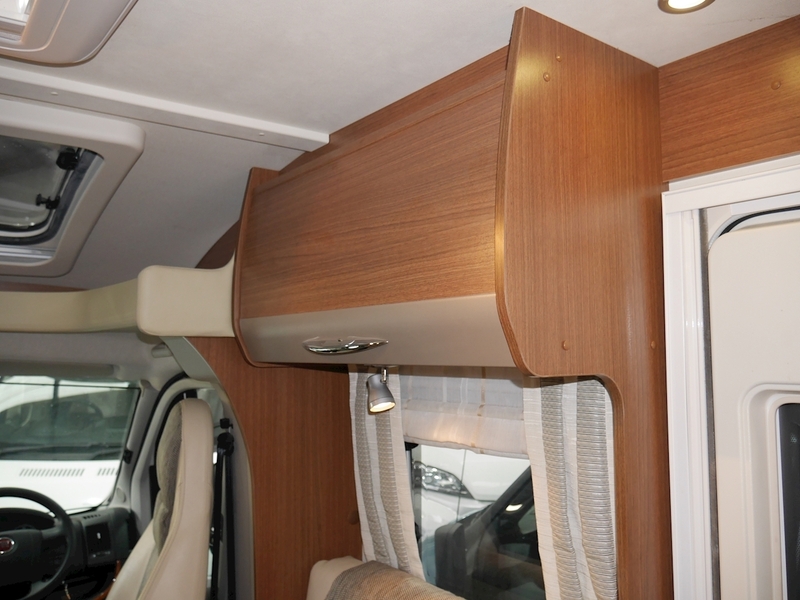 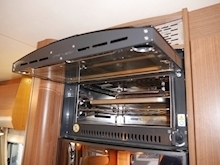 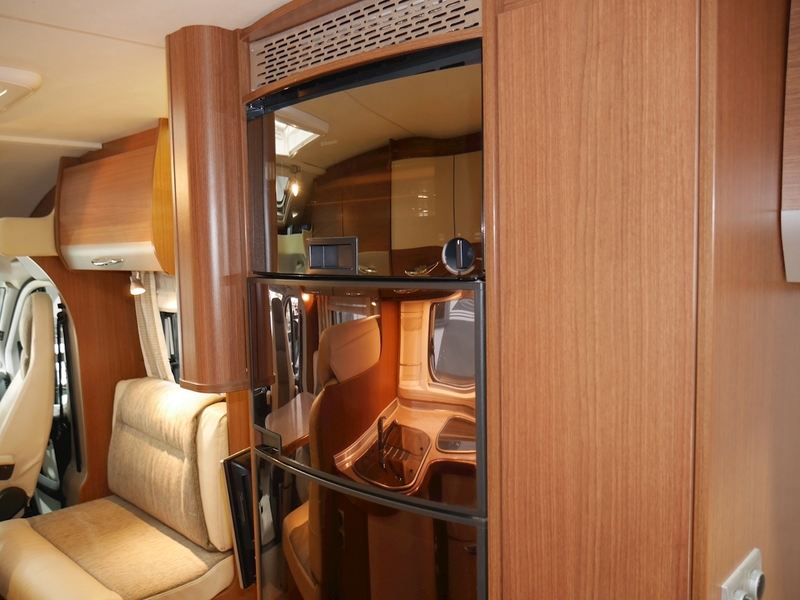 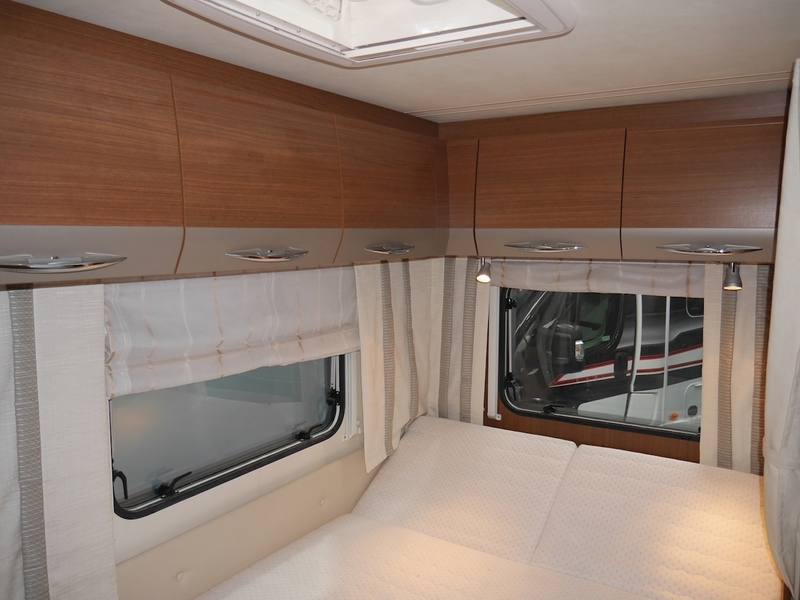 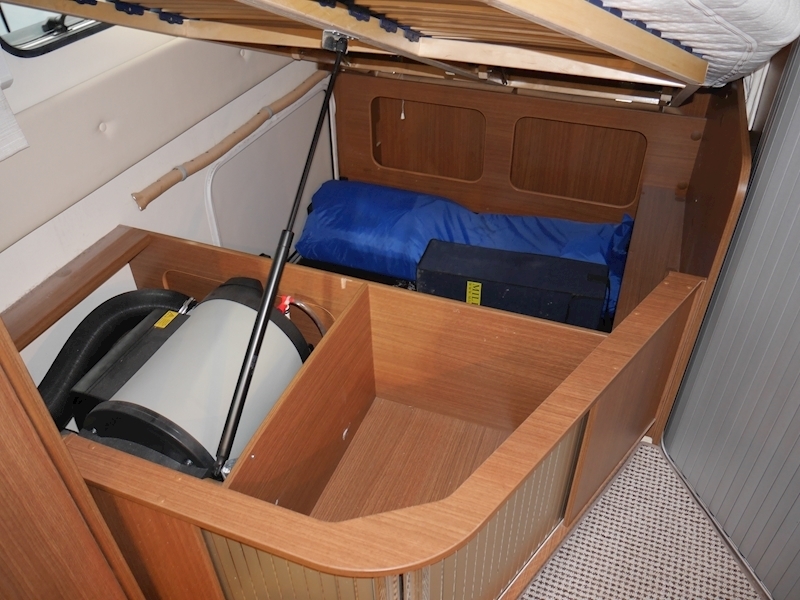 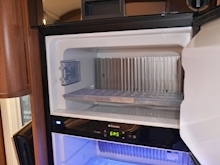 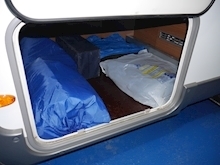 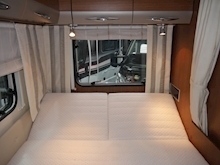 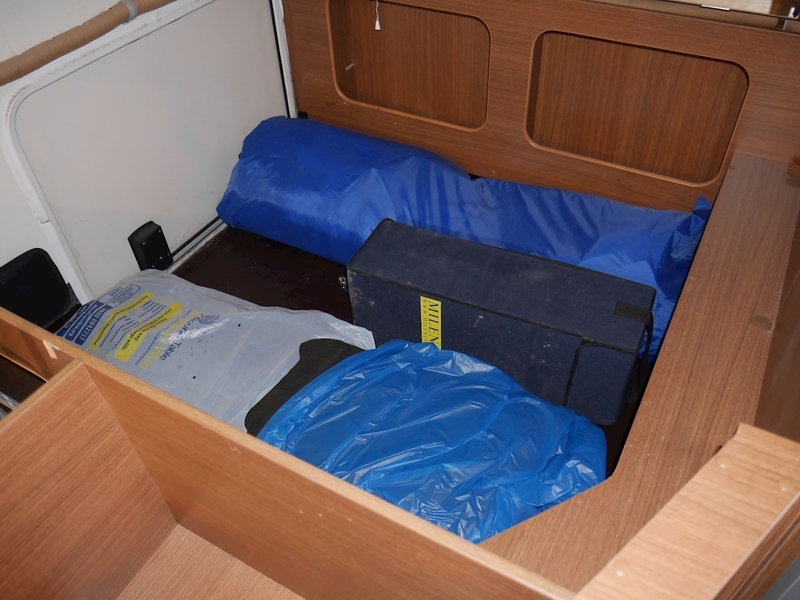 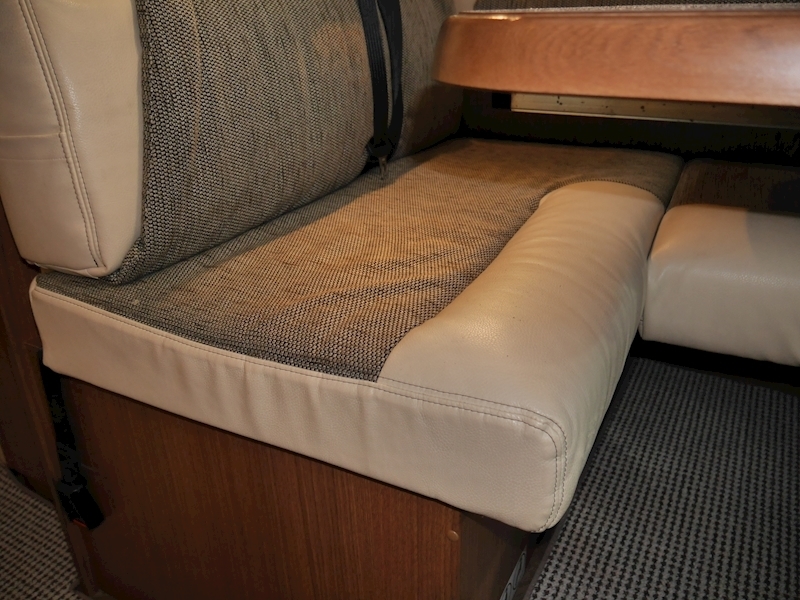 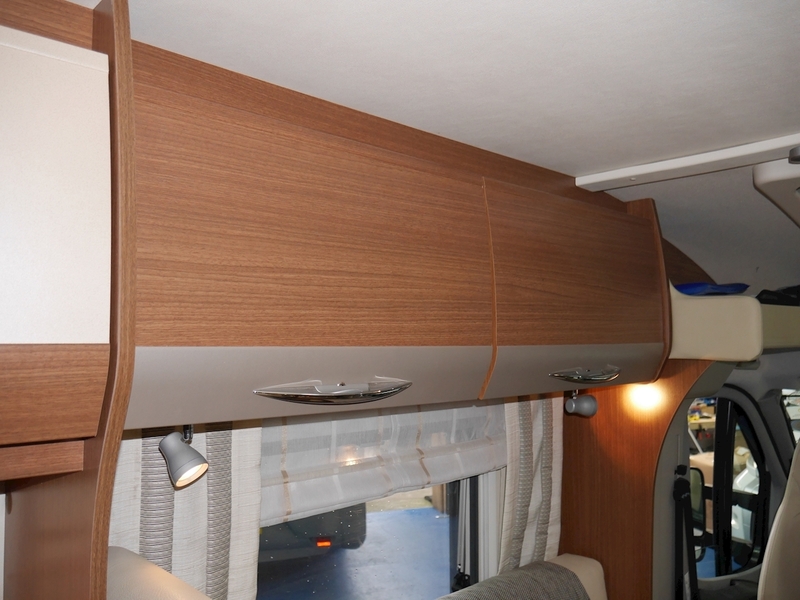 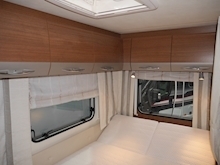 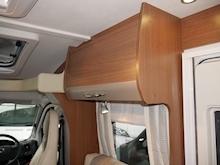 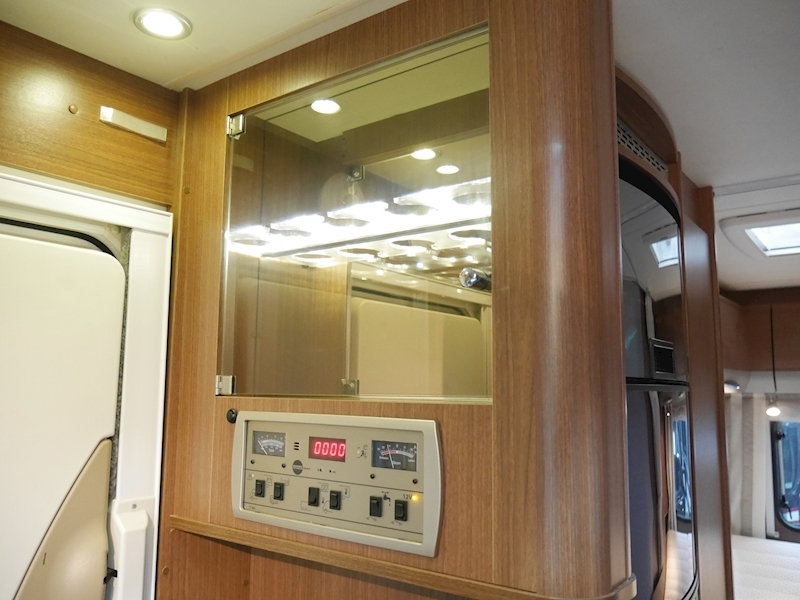 For storage, you have overhead lockers and space beneath the double bed, which lifts up via air struts. The washroom is accessed through a sliding door to the right hand side of the bed. 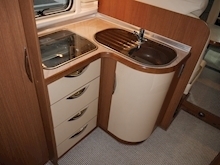 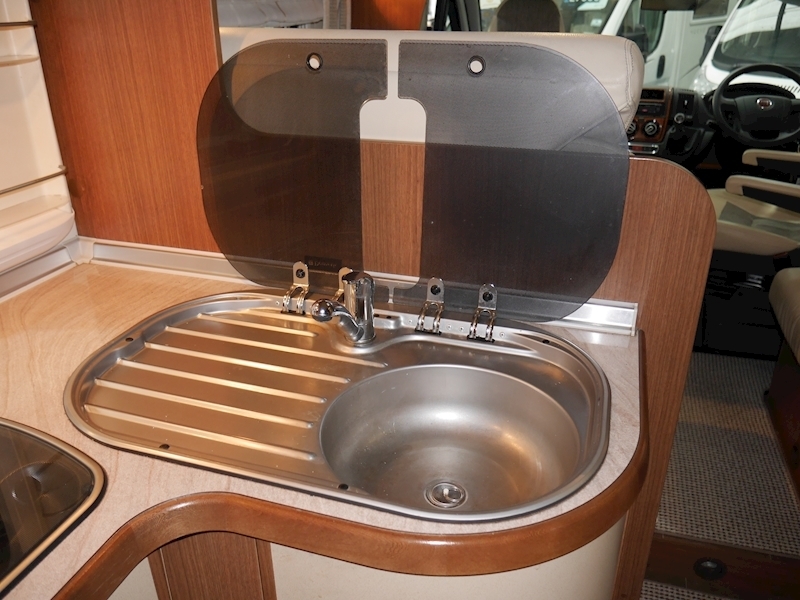 Inside there is a semi-circular wash basin unit, with a chrome mixer tap and a vanity unit below. 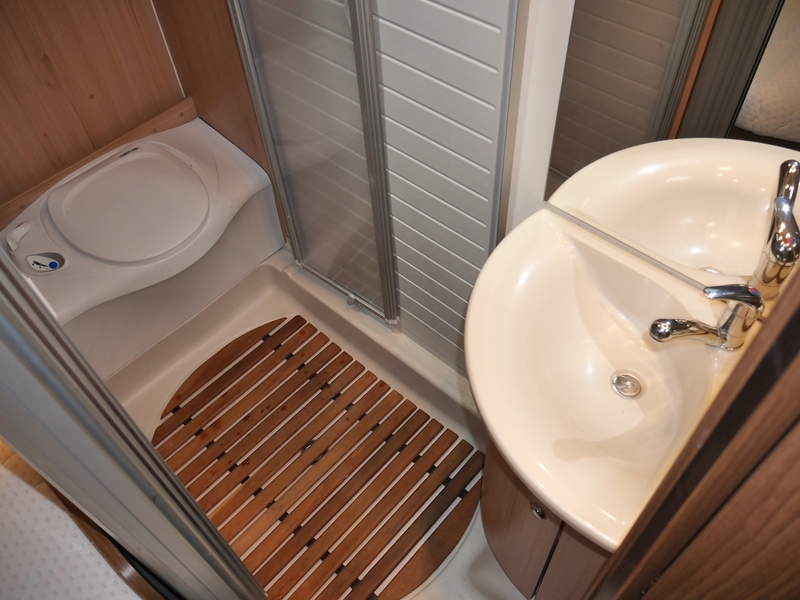 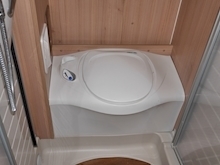 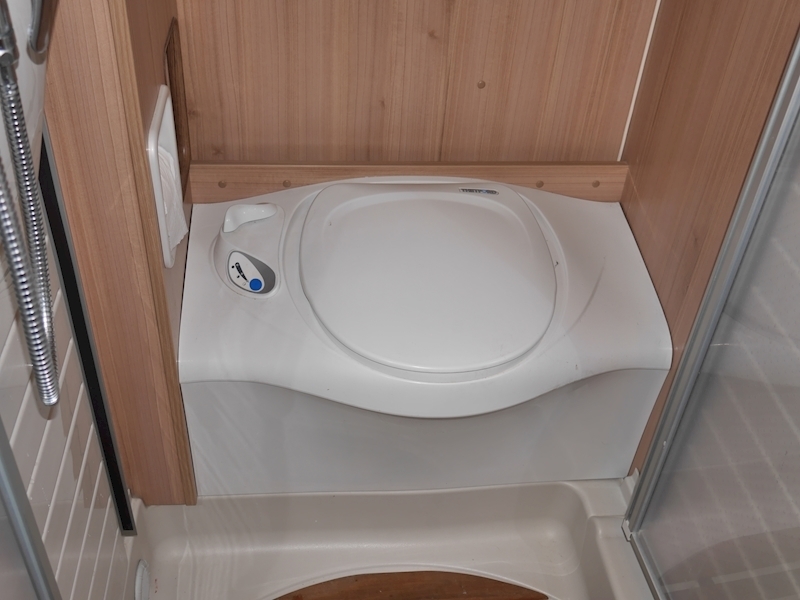 Centrally is the shower unit, which has folding doors to enclose it, whilst the Thetford electric flush toilet is positioned on the far side. 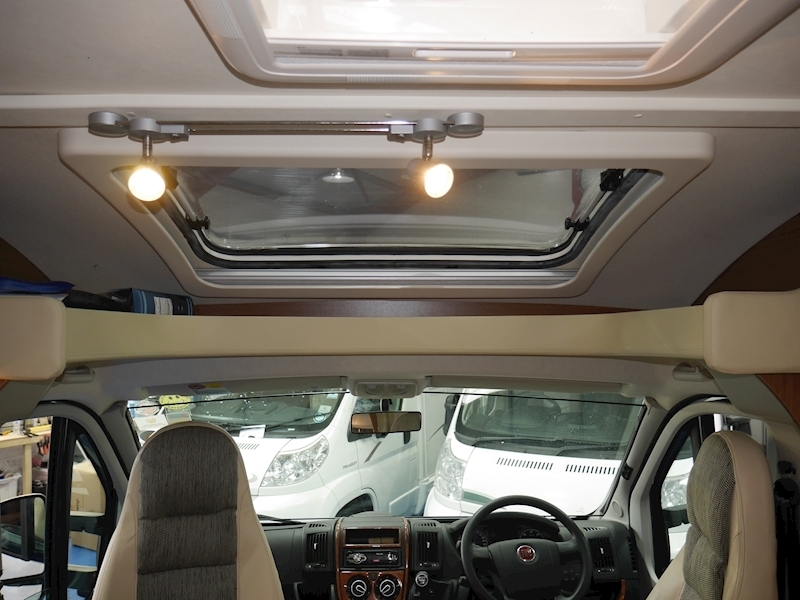 To complete the area you have a roof-light for ventilation.